Skyrim's music was composed by Jeremy Soule, who also composed the music for both Oblivion and Morrowind. A four-disc soundtrack release was available physically from DirectSong and is digitally available from iTunes. For the first time in the series additional music was created for add-ons for the game, though no official soundtrack of the music from Dawnguard and Dragonborn has been released. The complete soundtrack for Skyrim totals almost 4 hours in length. The Elder Scrolls V: Skyrim Original Game Soundtrack could previously be purchased from DirectSong and is still available on iTunes. The physical release is split over 4 CDs. The fourth disc contains "Skyrim Atmospheres" which consists of various pieces of ambiance, sound effects, and music from the game, notably the mus_palette tracks. Two extended pieces of music are missing from the original soundtrack release: mus_combat_boss and mus_dungeon_cave_02. Most of the shorter tracks have also been excluded. Dawnguard adds several more unnamed tracks as background music when exploring Castle Volkihar, the Soul Cairn, and the Forgotten Vale. The song mus_eclipse plays when firing a Bloodcursed Elven Arrow and causing a solar eclipse. None of these tracks have ever been officially released. Dragonborn adds several tracks for exploring Solstheim and Aprocrypha. Most of the music for exploring Solstheim has been taken directly from Morrowind's soundtrack. The new music has never been officially released. 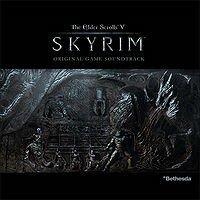 Skyrim's soundtrack was nominated by the British Academy of Film & Television Arts for Best Score in the Game Music Category, but was beaten by L.A. Noire. It was also nominated by Game Audio Network Guild for Music of the Year and Best Original Soundtrack Album, but again lost. The main theme, Dragonborn, won the Game Audio Network Guild's Best Original Vocal (Choral) award. "Dragonborn" is the latest version of what Todd Howard has called the "Elder Scrolls Theme". It first appeared as "Call of Magic" (aka "Nerevar Rising") in Morrowind and then as "Reign of the Septims" in Oblivion. The latest version is the first to include lyrics, sung by a men's choir in the dragon tongue. The original version and a translation appear in-game in the book Songs of Skyrim. The track "The Jerall Mountains" originally appeared in Morrowind as "Rise to Reality" ("Silt Sunrise" in the Special Edition soundtrack) and in Oblivion as "Through the Valleys". The piece "Wind Guide You" is a remake of "Minstrel's Lament", which also appeared in Oblivion. "Unbroken Road" shares a motif with "Reign of the Septims," first recognizable at 0:26 in "Reign of the Septims" and 0:58 of "Unbroken Road." Composer Jeremy Soule has shared his inspirations and background information about some of the tracks on the soundtrack. Due to the length of his commentary, his remarks on each track have been hidden with collapsible show/hide tags. From Past to Present - this composition represented a new approach for me in my writing in that I was wanting to create a "living" piece of music. It is music that doesn't owe anything to a creator, it just exists. And somehow, in some abstract fashion, it has always existed. I find that this is the most challenging but specific goal that I now have as a composer. But this creative goal isn't unique to me, nor is it something that I invented. Incredible works such as Debussy's Claire de Lune show me just how much more I can strive for in this very mysterious quality of "living" music. Hammered dulcimer? No, actually it's prepared piano. I used pencils to strike the strings. For me, music is a literal language. And like some "multilingual" persons, it is sometimes difficult for me to clearly express what is going on in my head. To illustrate my process, I sometimes speak in English as my music is being performed to describe, in real-time, what each phrase is communicating. It is a neat party trick. Some composers are shy or indignant about disclosing their back-processes. I'm not. And, I wish more composers would speak more about their creative process. That said, I don't want to seem self-indulgent with an arduously long post. But, for those that are interested, I want to provide a window into the intense factoring that goes on each and every time I create music. So why am I doing all of this when I make music? I want to always move the player forward. And with Skyrim, I also wanted to instill a sense of purpose in the environment in spite of the various adversaries or intimidating landscapes--all frequently seen in the game. This composition was challenging despite the slow tempo and monolithic movements. My multi-layered approach was to embolden the player with a narrative. This was accomplished through a specific structure. The first part of my structure/device was the acknowledgement of adversity. The second was to provide an enlightened incentive to overcome the adversity, and the third part of my construct was to provide a sense of scale of the world to create relevance for the entire idiom (the frame of the painting). Overall, I wanted the theme of the narrative to be about a dark hope and an illustration of an almost unsaid acknowledgement of a repressed truth. This narrative also starts with a metaphor. In this metaphor, I presented what I call the "walker" (or soul) whose footsteps are represented in plodding half notes. The next cast members of this metaphor include nature, light, darkness and death itself (adversity). Representing adversity, the male voices in plodding half notes bring a cold and icy reality which reveals a lumbering walk to the end of a life. (0:00 - 0:48) Death is the truest adversity in literature. Yet, this death pattern becomes lifted from these darkened voices to be transfigured and answered as a voice of the natural world... in this case, the violins. As nature lifts the countenance of this "death walk", light (in female voices) begins to pour onto the path of the walker. (0:49 - 1:19) A placid texture of nature (1:21) brings a calm setting before a baritone soloist (1:52) introduces a concept of spiritual redemption (the incentive) and a pronouncement of a greater truth. His texture also represents the purest form of bravery as he is both cautious and meek (again, the incentive). His message is affirmed as truth by the light of nature (2:24) represented in the female voices. But at 2:37 these women's voices sing something more urgent and pleading. I wanted their message to be an intercession for life and a balance to the darkness heard at the beginning of the work. The phrase delivery is of an intense and painful love... or something almost beyond love. It is almost that they are saying "hurry for the sake of your eternal joy". Yet there is a knowing balance here that leaves room for the individual to determine their own fate. The strings of "nature" at 3:19 are meant to create a sense of opening arms and hands that are being dropped to either side as if to uplift the walker. Yet none of this is meant to provoke a decision on the part of the walker. As death is a balance of nature, the concept is reintroduced in the strings at 3:51 with a lament of life by the "light" and ultimate acceptance of the purpose of the darkness at 4:25. The new octaves faintly heard in the female voices represent a respectful acknowledgement of death at this point. At 5:12, in a sort of vignette of this world, the male and female voices combine to represent an illustration of the marriage of death and life (the sense of scale). Yet the message now is carried forth without an intended recipient (again, meant to illustrate scale through an impersonal delivery). The pleading of life dissipates into the natural world, but at 5:49, nature is alone. This also represents the "frame" of the composition. Of course, none of what I've written above addresses the underlying musical theory elements and choices I've made out of sheer musicality concerns in performance. However, they are all linked. I hope some of this makes sense. Again, I simply wanted to provide a bit of a window into my process. And if you read this far... I applaud you. Good job! You're as crazy as I am. The solo instrument you'll hear in this piece is called a duduk. It's a rather interesting reed instrument. "Solitude" describes two points of reference... the first is of an accepted but somber reality and the other is of an ideal realm that was meant to be, but for whatever reason, was never realized. I find this juxtaposition to be a basis of good lore as it creates a question about the value of a dream vs. the practical reality of life. For those still reading this, the celli and harp bring the "reality" and the voices are the sound of what is "beyond". Fairly straightforward enough? Now, if you've suffered through reading this much text, I'll go on to say that you can hear in this music a sense of true love. Yet, the place of truest love is unattainable. Or is it? One thing is certain, I always infuse as much of my life experience as possible into my work. Who did I really think of when I wrote this...? Of course, it was my Immortal Beloved! Every composer has at least one. Humility... Even when the textural scale is gigantic and there are 1000 digital musicians involved, the narration here is one of humility. This composition is about the coming to terms with a profound loss through the embrace of a larger principle. And even as life passes, the narrative of our lives lives onward. And in that light, we are forgiven. The last composition I composed for Skyrim. The reference to Minstrel's Lament from Oblivion was intentional. It was my way of saying goodbye as I considered my role to be somewhat akin to a minstrel. The tighter in shape melodic intervals are (such as a third interval), the feeling of age appears. And the Elder Theme is the "oldest" motif in the score with a major third in range. Wind Guide You! I still remember the moment I first heard this music in my consciousness. It was fragile, so I became to be in a hurry to write it down. Sometimes ideas for me are very ethereal. In these moments, I have to stop communicating with the world and concentrate. Anyone that's been with me might say I was daydreaming. But, the music is loud when it is present. I can't ignore it. Yet I know that once when I hear it, it may never return. So careful transcription in these moments is critical. That's the life of a composer... it is about listening to what is inside. This disc was carefully constructed and took months to complete. In this recording, I'm working with various psychological and acoustical theory that utilize precision tunings to create a very special "atmosphere"... There are even mathematics in this music that reflect planetary and celestial physics. The journey of this music takes the walker to the lower lands, from where the journey will eventually ascend to the ceiling of the world. When you hear the winds at the end, you are in excess of 14,000 feet, and you are hearing this atmospheric pressure and common temperature. This was all processed in simulation software. What does music sound like in my dreams? This composition "appeared" to me as I dreamt I was a disembodied spirit flying over a beautiful and mountainous world. Coincidentally, the fan video here reflects a touch of that experience. Often a challenge for me with dreams is in transcribing my experience once I'm awake enough to logically function... As too much logical thinking can fry any memory of a dream. To avoid losing dream music forever in a post-awakened haze, my first step is to concentrate on recalling the strongest emotions I experienced in the dream. Emotions in dreams are like emails. And if emotions are the emails, the details of dreams are (sort of) carried in attachments to emotions. Why is this? Our brains always seem to dream emotionally. Emotion is what I believe is the top of dream hierarchy. It's why the feeling of a nightmare lasts even as we can't remember what scared us in our sleep in the first place. So in other words, these emotions are the psychological breadcrumbs that can take you back to where you once belonged. Once there, attempt to recall your music (even if it is on a dreamy rooftop somewhere) and write everything down... Immediately. And this probably goes without saying, but always keep a notepad, iPad or some kind recorder next to your bed. Doing so just might help you bring another world into ours. In previous games the music was available as MP3 files in the main game directory, but for Skyrim the files have been included in Skyrim - Sounds.bsa, and encoded with a ".xwm" extension. Once extracted from the BSA, they can be played using MPC-HC (no playback issues) or the VideoLAN media player, which is also able to convert them to other formats, such as MP3. The music can be converted to wav via xWMAEncode.exe found in the Microsoft DirectX Software Developer's Kit. The SDK is about 500MB compressed and requires installation, but the basic .exe is a standalone encoder/decoder, thus best found and used without the kit. The Main Theme can be found in the "special" directory. The music format differs between the different platform versions of Skyrim Special Edition. PC and Xbox One use Microsoft xWMA format (.xwm) at 48kbps to store music. PS4 uses Sony Atrac format (.at9) at 144kbps to store music, and is considered to be much higher quality due to the higher bitrate. The trailers for Dawnguard and Dragonborn each have a unique theme which is not present in the game itself or available as individual releases. The song "Unbound" is on the official soundtrack yet does not appear anywhere in the game nor is present within the game's files. It was possibly originally intended to be played during the quest Unbound when Alduin attacks Helgen. The song "The Jerall Mountains" is included in the game's files but is not actually assigned any music playlists and therefore does not play in the game. The song "Nerevar Rising Reprise" was composed and recorded for Skyrim , but ultimately released only on the Morrowind Special Edition Soundtrack. The compression algorithms used by the game can cause parts of the soundtrack to drop out or be over-emphasized. For instance, the percussion section is far more audible in the in-game version of "Tooth and Claw" than in the soundtrack version. Compare the in-game version of "Tooth and Claw" to the soundtrack version. ^ Jeremy Soule, Facebook, August 12, 2013. ^ a b Jeremy Soule, Facebook, March 26, 2013. This page was last modified on 28 January 2019, at 23:09.